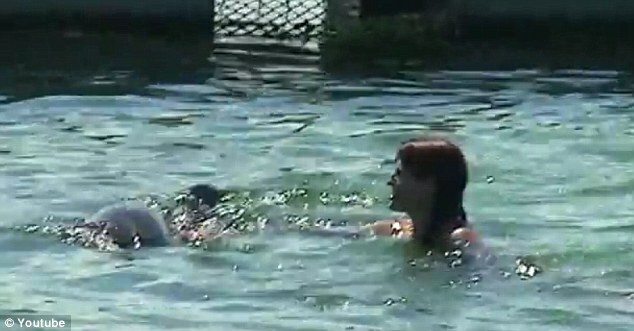 (dailymail.co.uk) - When an Argentine tourist decided to take the plunge and swim with the dolphins on her family holiday in the Dominican Republic, she had no idea what kind of a splash it would be. 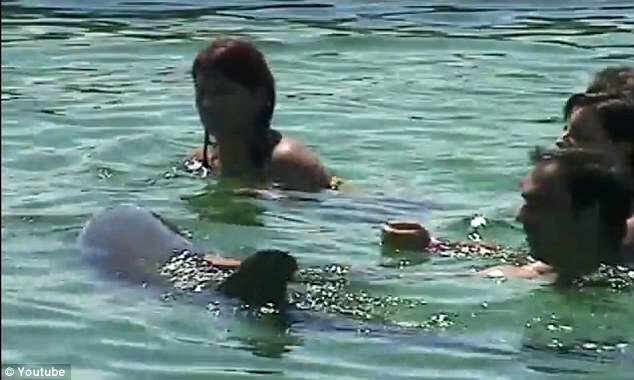 Unsuspecting Silvana Straccia paid $100 to swim with the creatures at Bavaro Beach in Punta Cana, wearing a bikini with a metal ring on it that irritated the dolphins. 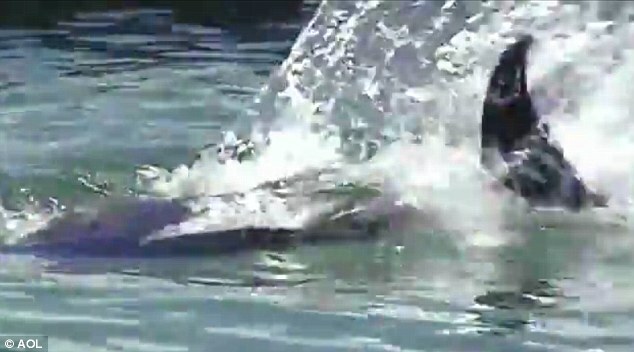 Moments after she entered the enclosure, a dolphin locked on to her and whipped her in the face with its tail before hitting her in the stomach - sending her to the hospital with broken cartilage and requiring 8 weeks of bed rest. She uploaded the video of her attack onto YouTube and titled it The Day that a Dolphin Almost Killed Me. She was on vacation with her husband Ruben and son Gianfranco, her husband taping the once in a lifetime experience and her son watching from the dock. 'Watch , from the moment I leave my son on the deck and how they cannot stop looking and following me,' she writes on YouTube. She joins the other swimmers at the center of the area with a dolphin tailing her. Almost immediately, it begins to emit a high, piecing noise. The swimmers, unaware of what is about to happen, think the dolphin is just playing with them. Family: Her husband, right, taped the once in a lifetime experience while her son watched from the dock. The dolphins circle her, singling her out from the other swimmers. She smiles at the attention and then suddenly, the animal whips its tail into her face. 'First one throws water in my eyes, the other one comes behind and hits my chest, and sank me under the water,' Mrs Straccia said. While it may look like fun and games, she ended up in the hospital with broken cartilage and extensive bruising - all on the third day of her vacation. 'I almost died as I couldn't breathe... all my body was in shock. It was horrible and I will never forget it,' she said. The doctors told her if the dolphin had used its nose to strike, she would not have survived. Doctors told her that the dolphins reacted to the metal ring on her bikini top, as shiny accessories often anger the creatures. After the incident, she took them out. Manati Park is quite rightly heading rapidly to the bottom of all the trip advisor reviews for Dominican Republic visitor attractions - this place is simply horrible. As previous reviewers have explained in detail, the staff around the food and shop area are overly pushy trying to sell all manner of tacky rubbish, as well as quite openly leering and attempting to hit on any attractive female visitors. But the worst thing about this place is their utterly depressing lack of respect for the animals they keep. 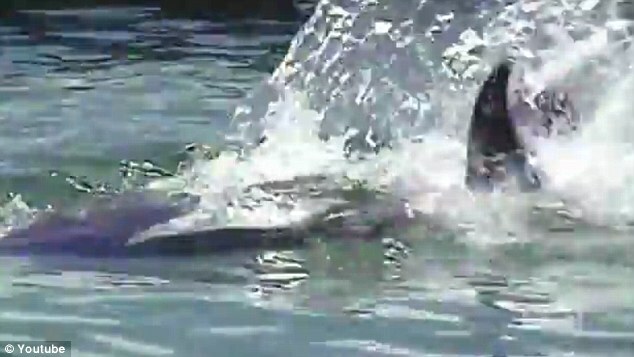 This was at its worst for the marine mammals - sea lions and dolphins. The sea lion show was utterly demeaning to these clearly intelligent animals, like some hideous throw back from the 1970s with the animals mindlessly performing anthropomorphic tricks for food. The two dolphins are kept in a pool far smaller than your average hotel swimming pool - this for animals which live in complex social groups and swim up to 50km a day in the wild. Then a few times a day they have ear-splitting music blasted at them (dolphins have very sensitive hearing and this must be turturous to them) along with their pool being filled with up to 15 hapless tourists who seemed at liberty to grab and poke at the dolphins as they swam around them. We stayed in the arena for a while after the crowds had left and saw 'Cain' (one of the dolphins) sink to the bottom of the pool and stare at the corner for at least 10 minutes - we were then asked to leave as visitors aren't allowed to watch the depressed dolphins in between manic shows. What a horrible schizophrenic existence, all to 'entertain' tourists and make a quick buck. It's extremely sad that our love of dolphins and our understanding of their intelligence does not translate into respect for them - if it did then we wouldn't keep them in places like Manati Park. What's more, the food-bribed behaviours of the dolphins in the shows don't teach visitors anything about dolphins in the wild. And then the sign on the wall has the audacity to say that the facility is about 'Nature, education and conservation' - this couldn't be further from the truth. If you love dolphins don't support cruelty to them by paying to visit Manati Park. If tourists vote with their wallets eventually places like this will go out of business and dolphins will be left where we can best appreciate them - in the wild. My husaband I went to manati park thinking we would see some nice animals, what we found was the animals looked half dead and in very poor condition. We thought someone that worked at the park was showing us around, to end up being lead to their market place and being pushed into buying there stuff. We were considering swimming with the dolphins until we seen the conditions of the zoo and decided to not support it. I'm pretty laid back and didn't expect anything spectacular, but this place really was terrible. I was in Punta Cana in January 2009 for my wedding. The resort was wonderful and my wedding was beautiful........ but I went to Manati Park to have a Dolphin encounter that turned out to be heartbreaking!!! Horrid conditions keeping them in a small pool while performing and tiny holding tanks all day until the 2pm show, then back in these tiny tanks with no room to even swin or turn around!!!!!!! The water was smelly and the dolphins were very tattered and abused looking, cuts nips ect........... how cruel! It is sick and abusive and how is this possible!!!!!!!!!!!!!!!!!!!!!!!!!! !